Drum Corps International Executive Director Dan Acheson is overseas this weekend for the Drum Corps Europe (DCE) Championships on Saturday, Sept. 23. He sent the following account of his first day in Rotterdam, the Netherlands. When I arrived in Amsterdam, I was met by officials from Drum Corps Europe and Drum Corps Netherlands while waiting for the arrival of three judges from the United States and two from the United Kingdom. We drove from the airport to Rotterdam (The Netherlands) which is about 40 miles. 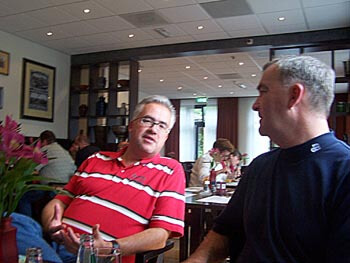 Dan Acheson (right) with DCE Chairman Marcel Matthijsse. I had dinner that evening with several of the volunteers working the DCE Championships as well as all the judges. They showed a tremendous passion for the drum corps experience, and if our conversation over dinner is any indication, I will learn quite a bit from the many good folks involved in drum corps in Europe on this trip. Avalance, a "cadet class" corps from Vlaardingen, Netherlands, performs in downtown Rotterdam. 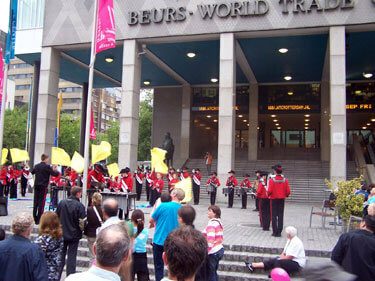 Six corps had standstill performances in Rotterdam in front of the Beurs World Trade Center. I have watched many of this type of promotional performance in the past, but what struck me about this one, was the large community of drum corps that came together as the evening progressed. Many of the various corps staff and corps members in attendance visited with each other. That made me feel right at home. It is late in the evening now and a full day of championship performances are ahead. I can't wait.